On December 2, the Solar and Heliospheric Observatory (SOHO) celebrated its 16th birthday. SOHO is a joint NASA/ESA satellite packed with twelve instruments to study the sun. An amateur astronomer in Australia has given it a wonderful birthday present: a new comet to observe. Will the rest of the world get to join in on the festivities, welcoming a new visitor to the sky this December? The comet, officially named C/2011 W3 (Lovejoy), was first imaged by Terry Lovejoy on November 27 (read Lovejoy's account of the discovery here). The amateur astronomer was processing 200 image sets he had snapped of the sky using his C8 Schmidt-Cassegrain telescope. Lovejoy reports that his setup allows him to capture only 4.5 square degrees of sky at a time, which equates to about the distance covered by the span of your ring, middle and index fingers when held together at arms length. At first, Lovejoy assumed the fuzzy smudge of light he noticed on one image set might be an errant reflection caused by his imaging equipment. But on November 29, he was able to see it again, noting that it was moving rapidly at a rate of about 3 degrees per day. Independent verifications from other astronomers confirmed it -- Lovejoy had found a comet. 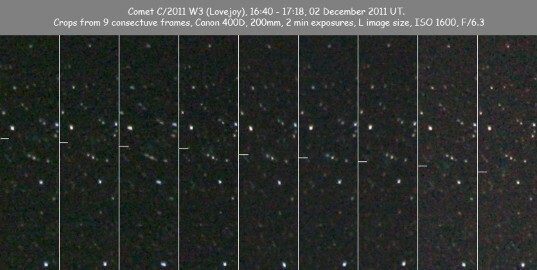 C/2011 W3 (Lovejoy) is shown here in a series of images taken from Bright, in Victoria, Australia. Tick marks in each frame show the location of the comet, which currently appears as a faint, fuzzy smudge. C/2011 W3 isn't just any comet -- it's a Kreutz sungrazer. Sungrazers are a class of comets that pass extremely close to the sun at perihelion, the closest point of approach in their elliptical orbit. Many sungrazers don't survive this violent encounter and evaporate. Others are ripped apart by the Sun's tidal forces and continue onward in new orbits for subsequent passes years later. That was the case for a particular comet family observed by German astronomer Heinrich Kreutz in the late 1880s. 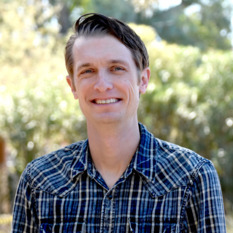 Kreutz was able to determine that a particular group of sungrazers may have originated from a single comet that was torn apart centuries earlier. According to the folks at SOHO, C/2011 W3 should be in range for sun-based imaging starting December 12, and the closest approach should come on December 16. It's too early to tell whether Lovejoy's comet will survive the encounter. According to the website Heavens Above, perihelion will occur when the comet is at a mere 0.006 AU from the Sun. That's only 898,000 kilometers, and we haven't accounted for the Sun's radius, which is 695,000 kilometers. That puts the approach a mere 203,000 kilometers from the surface, about one-half the distance between Earth and the Moon. Good luck, brave comet. On to the big question: will we see the comet in our skies? Not unless you live in the Southern Hemisphere, and even then, the odds are slim. The comet is currently near the constellation Lupus, and will pass through Scorpius on its way to the Sun. It's tricky to estimate how bright it will get, but current CBET data show a potential magnitude of -3.4. CBETs are "Central Bureau Electronic Telegrams" published by the International Astronomical Union that contain the official word on the discoveries of comets and other astronomical events. You need an account to access CBET data, but thankfully, the folks at Remanzacco Observatory in Italy have republished the particulars. Other magnitude estimates for listed C/2011 W3 range from 2 to -2, according to the U.S. Navy's Sungrazing Comets website. What do we mean by magnitude? In astronomical terms: the lower the number, the brighter the object. A magnitude of about 6 or lower is required for detection by the human eye. If Lovejoy's comet flares up to -3.4, it would be seen on Earth as a very bright star, brighter than most of the planets. Unfortunately, by then it will be so close to the Sun, ground-based observation will be next to impossible without some sophisticated filtering equipment. Luckily, SOHO and STEREO will be watching from space, giving us front-row seats of Lovejoy's comet as it approaches the sun. I'll be posting updates on Twitter periodically as more information becomes available, so stay tuned!